Download the Starbucks® app and create a Starbucks Rewards™ account. Existing Starbucks® app users: Simply go to the “Pay” section of the app to get started. 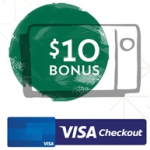 Use the Starbucks® app to load a minimum of $10 onto your Starbucks® card using Visa Checkout as your payment method. You will receive a $10 Starbucks® eGift card to the email address associated with your Starbucks® account within 24 hours of the load. Each customer is only eligible for one bonus. In addition, supplies are limited and there is no guarantee you will receive a bonus load. For more info, visit starbucks.com/promo/visacheckout.